New York. Chicago. Paris. New Orleans......But Sydenham?This London suburb isn't somewhere one instantly associates with jazz. 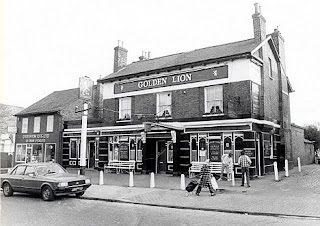 Yet once a month, the Golden Lion puts on great live jazz music for an enthusiastic crowd (and there are separate blues nights too). With the London Overground making central London only 25 minutes away, it's well placed to flourish. Thanks to the enthusiastic efforts of Fiona McSorley - who has patiently built up these monthly jazz nights without website or email, relying solely on word of mouth - the pub is host to some great small-scale gigs which deliver big results. The ambience is good - think 'south London boozer', with embossed wallpaper, pictures of local scenes on the wall and regulars clustered at the bar. And this is a good thing: it's a place to meet, to chat, escape the stresses of life in London. The jazz is in a back room, with a capacity of around 45. It's friendly and intimate, a mix of regulars and newcomers like me, there with seven members of the London Jazz Meetup. The sound is good, thanks to an cracking Bose PA and overall it's a cosy spot for London's players to stretch their jazz muscles. Sadly, the piano has now gone. That didn't matter on the night I attended (24th April 2012), with bassist Mario Castronari 's quartet playing a 2 hour set of standards and jazz-twists on modern soul and pop classic - Black Orpheus, Night in Tunisia and Watermelon Man the highlights. Mario uses every inch of fingerboard real estate to deliver wonderful grooves. Joined by sax player Brian Iddenden, Dominic Grant - whose finger-style acoustic guitar bought a latin tinge to proceedings -, and Jasper Morrissey on drums, his quartet entertained us properly and thoroughly.